It’s hard to believe that three years has passed since Malaysia Airlines Flight 370 disappeared. The Boeing 777-200, carrying 239 passengers and crew, literally vanished from radar screens in the early morning hours of March 8, 2014. But just how did one of the world’s most sophisticated airliners become invisible—never to be seen again? There are a lot of theories out there about what happened to MH 370, some of them reasonable, others just plain nonsensical. I’ve addressed a couple of the former, but my purpose here was to offer a speculative, but logical, theory of what happened. However, it’s my opinion as an aviation analyst and 777 captain that the simple question of what happened may have a simple answer that involves complicated circumstances. What exactly do I mean? It’s my belief that a single mechanical event was the catalyst that led to the disappearance. That event in turn affected systems that doomed the airplane. At 00:42 Malaysia time, MH 370 departed Kuala Lumpur’s Runway 32 Right destined for Beijing. 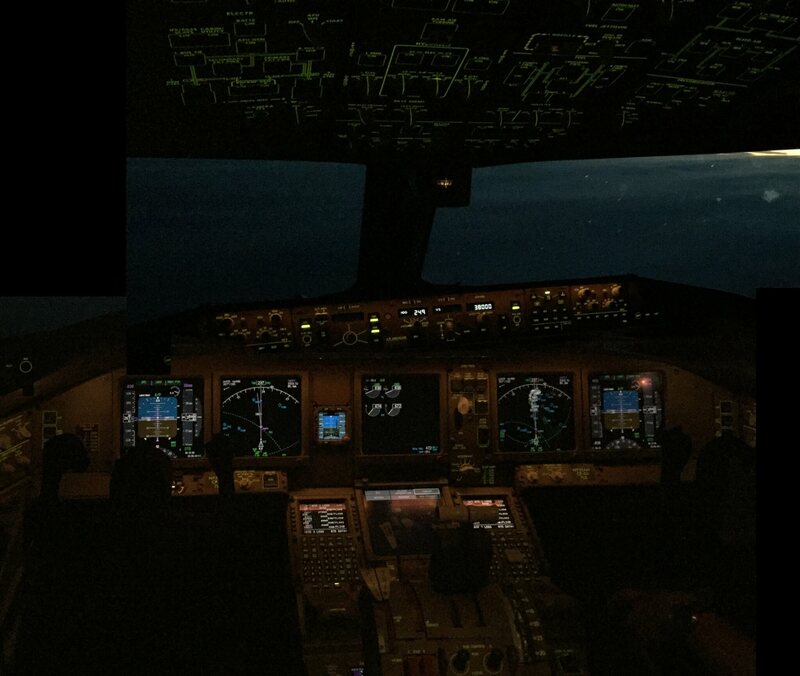 The flight remained in radar and voice contact until 01:19 at which time the infamous “Good night, Malaysian Flight three-seven-zero,” was transmitted by one of the pilots to Kuala Lumpur air traffic control. The final words were a routine communication before being handed off to Ho Chi Minh radar in Vietnamese airspace. This became the last moment of anything routine. Within about two minutes, the airplane’s transponder, the device that transmits a discreet code for air traffic control radar, ceased to function. Even though MH 370 seemingly disappeared from Kuala Lumpur’s radar screens, military radar tracked a primary target that appeared to have made a drastic turn to the southwest, almost a complete course reversal. The last official radar position placed the airplane 200 nautical miles northwest of the Malaysian island of Penang, a bizarre track. In addition, the ACARS (Automatic Communication and Reporting System) on board appeared to be non-responsive and possibly inoperative. A few days later, technicians at Inmarsat, the company that owns the satellite network utilized by many airlines, made an incredible discovery. At periodic intervals, MH 370 transmitted “handshakes.” Handshakes are a simplified computer-generated message that tells the satellite that a specific antenna on a specific airplane is avail able for data or voice communication. In other words, the on-board MH 370 satellite system was functional. 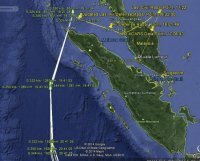 As a matter of fact, the Inmarsat data indicated that MH 370 remained airborne for almost exactly seven hours after the last voice contact with Kuala Lumpur air traffic control. This revelation led the investigation to determine that the Boeing 777 flew until fuel exhaustion over the southern Indian Ocean. Complicated analysis by numerous industry experts utilized satellite data, potential flight path calculations, and environmental conditions to define a search area. That area was narrowed to approximately 46,000 square miles of ocean. At one time during the multi-national search effort, four vessels were involved. Although some pieces of debris have been found washed up on mostly East African shoreline, only seven have been identified as having a high likelihood of belonging to MH 370. The locations of the various pieces are consistent with drift analysis originating from the search area. One of the pieces found is a portion of the airplane’s flaps. Inspection of this part led to an analysis that the 777 impacted the water at a high rate of speed, which contradicted a theory that the airplane touched down smoothly on the surface of the water through guidance of a pilot. Unfortunately, the main wreckage has never been located. As of January 2017, the search has been officially suspended. Needless to say, the victim’s families are beyond frustrated. Adding to the frustration are the reports that investigators utilizing more detailed ocean drift analysis have re-evaluated the position of the current high probability search area. The new analysis defines an area further to the north, covering approximately 9600 square miles. As most folks are aware, without the ability to evaluate the actual condition of the airplane, a proper investigation can’t really occur. Absent the information available on the digital flight data recorder (DFDR) and the cockpit voice recorder (CVR)- the quintessential black boxes-the task is even more difficult. And as side note, even if the CVR is recovered, conversation may not exist on the recording. Why? The CVR is designed as a continuous loop mechanism, theoretically recording over itself every two hours. If nobody was alive in the cockpit, or only one pilot was alive, voices would not be heard. That being said, various other sounds might be identified that would assist in evaluating the status of the airplane two hours prior to its impact with the water. Through a program utilized by accident investigators, these sounds can be timeline synchronized with the data from the DFDR. So without definitive evidence, speculation continues. Some of the speculation is based on rational facts; other theories are just plain out there. For instance, some still believe the airplane was hijacked with 239 people and flown to a Middle Eastern destination with a ‘stan at the end of its name. This hijacking theory continues further with the possibility of the 777 being flown at a later date in another 9/11-style attack. On many levels, this theory is ludicrous. Why? First, some very smart people that include experts from Inmarsat and Boeing, notwithstanding a multi-national investigation team, have concluded that the airplane impacted the water in the southern Indian Ocean. Second, concealing an airplane the size of a 777 in some remote location without detection seems slightly problematic. Where do you hide 239 people? The support equipment required to service a 777, like fueling for instance, are not easily obtainable items. And why steal the airplane? Why not just hijack a flight and accomplish the terrorist mission? So… what makes my speculation any more credible? Nothing really, other than the fact I have flown the 777 for seven years with a major US airline. My two cents worth is based on insight. As mentioned previously, my theory is that the crew experienced a technical problem that became an emergency situation. Before getting into the technical possibilities, follow my logic on what most likely didn’t happen. First, it doesn’t appear that a hijack threat occurred. Malaysian law enforcement with the assistance of the FBI only found two passengers who raised suspicions. Apparently these two men were Iranian nationals utilizing stolen passports in a circuitous attempt to gain asylum in Europe. One of the Iranians, an 18-year-old, was hoping to reunite with his mother in Germany. No ties to terrorism were found with them or any other passengers. For an airplane the size of a 777, it would have taken a small army of terrorists to organize an on-board assault. From among the flight attendants on MH 370, nothing threw up a red flag either. No reports indicated collusion or even any type of socializing outside of work among the cabin crew. How about a threat from a crazed lunatic who made an attempt to breach the cockpit door? 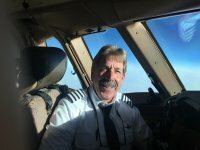 Assuming the rumors of Malaysia Airline’s lax in-flight security procedures were true, and a lunatic was able to open the cockpit door, in this day and age of heightened awareness, at some point flight attendants or alert passengers would have intervened. Certainly, both pilots wouldn’t have been completely disabled from a lone attacker at the same time. Okay, let’s focus on the pilots themselves. The copilot, Fariq Abdul Hamid, had just completed his initial operating experience flight with a check airman, making MH 370 his first official unsupervised trip. He was new to the 777 but not new to the airline. At 27-years-old, he was at the top of his game. Not many airline pilots have the opportunity to fly a sophisticated wide-body jet at such a young age. It seems unlikely that Hamid would have nefarious intentions nor did he appear to have been a candidate for suicidal depression. The captain, Zaharie Ahmad Shah, was a well-respected and well-liked 53-year-old veteran, employed by Malaysia Airlines for 33 years. He was passionate about aviation to the extent he built his own desktop 777 simulator. The simulator became the subject of speculation by virtue of the fact Captain Shah’s hard drive indicated a flight path apparently similar to the tracks considered by the MH 370 investigation team, implying that he practiced the disappearance. But other simulated tracks to other destinations were also discovered on the hard drive. Various unsubstantiated reports suggested that Captain Shah had motivation to make a dramatic statement because an in-law, who was Malaysia’s opposition leader, had just been given a jail sentence. Law enforcement investigating terrorist acts oftentimes discovers a trail of evidence that verifies affiliation with a particular group. Nothing in Shah’s background indicated political fanaticism or religious fanaticism. But let’s say something was missed. Perhaps the captain really did want to make a statement, or he was just plain suicidal. It would seem that a more visible display would be a better goal than to fly an airplane for seven hours until fuel exhaustion to the middle of absolutely nowhere. Kuala Lumpur’s Petronas twin towers, one of the tallest building structures in the world, could have made an attractive target…or even MH 370’s destination city of Bejiing. Could both pilots have conspired together? Sure. But no evidence of collusion or even socialization between Shah and Hamid outside of the work environment has been discovered. Some would argue that flying the airplane to the middle of nowhere was actually the objective — an airliner disappearing in front of the world. I have difficulty with that theory. 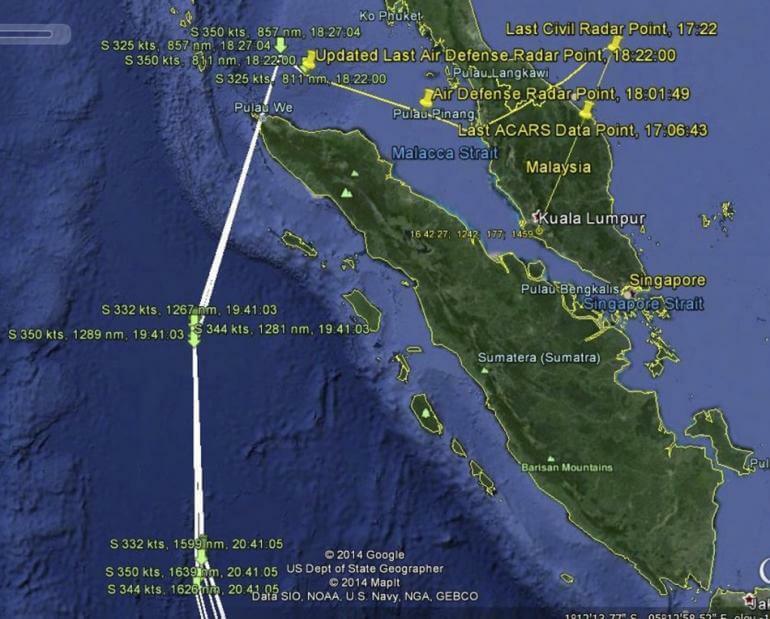 If indeed disappearance was the motivation, why would the airplane have been flown back over the Malaysian peninsula? Although most airline pilots are not intimately familiar with the range and location coverage of air traffic control radar, civilian or military, an experienced captain would assume his airplane could be tracked when it flew over land. Where does my logic leave us? An event on board MH 370 created an emergency situation that eventually incapacitated the crew. What kind of event? My guess is a circumstance that caused hypoxia. Hypoxia is basically oxygen starvation. At high altitudes, the air is not dense enough to be useful for the bloodstream to carry oxygen to the brain. With a sudden loss of cabin pressure at high altitudes, useful consciousness can be as little as 30 seconds. My gut reaction when MH 370’s drastic change in flight path was first reported was simple. The crew was attempting to fly back toward a diversionary airport while they dealt with an emergency situation. If the emergency was a sudden loss of cabin pressure, than the dramatic change in course made sense. Assuming the pilots recognized the situation immediately, their first reaction would have been to don the oxygen masks, ensure the automatic system dropped the masks for passengers, and then begin a rapid descent to a habitable altitude. Most airline procedures use 10,000 feet as a target altitude in such emergency situations. The flaw in the theory above is that it doesn’t appear as though the airplane descended at all, but rather remained at its assigned altitude of 35,000 feet. If true, that’s a disturbing fact. It is possible that the loss of cabin pressure was insidious, and not noticed by the crew until hypoxia symptoms became disabling. The erratic nature of the flight path tracked by military radar is indicative of pilots potentially suffering from the effects of hypoxia. Past accounts of slow leak pressurization events have shown similar irregular behavior patterns. A smattering of incidents have occurred involving a maintenance faux pas whereupon the crew emergency oxygen bottle located in the electronics bay indicates the appropriate pressure on cockpit displays, but the supply valve had only been partially turned on or not turned on at all. Enough oxygen remains trapped in the lines to allow pilots to take a few breaths, giving them the impression that air is available. So what event could have caused the hypoxia? In July of 2011 at Cairo International Airport on the ground, an Egypt Air 777 experienced a fire that eventually consumed the entire airplane. The fire originated from a failure of electrical wiring interacting with the crew emergency oxygen supply hose. If a similar situation occurred with MH 370 at high altitude, it is possible that the fire created a hole in the lower fuselage that eventually extinguished while the airplane continued to fly with the autopilot still connected. The crew would have been without emergency oxygen. This scenario might also explain the failure of the transponder, satellite communications, and ACARS systems. These systems are all located in the electronics bay. A theory that gained traction in some circles involved the potential corrosion of the braided wiring underneath the outside satellite antenna on top of the 777 fuselage. The corrosion could eventually create cracks and thus become a threat to structural integrity. 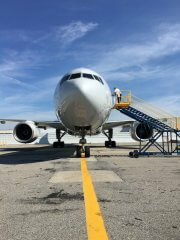 Initially, Boeing issued a service bulletin that highly recommended airline maintenance technicians inspect the area. After the disappearance of MH 370, the FAA issued an airworthiness directive (AD) for the inspection. An AD is a legally required maintenance task. The timing of the AD after the disappearance of MH 370 created suspicion among conspiracy theorists. Although some corrosion was found with other airlines operating the 777, none of the instances offered evidence that structural integrity had been compromised. In addition, Boeing claims that the satellite antenna adapter installed on MH 370 was not applicable to the AD compliance. And if the fuselage did crack underneath the antenna, allowing for a pressurization leak, how did the satellite system remain intact enough to continue transmitting handshakes? That being said, the theory is at least more plausible than most. Although the bizarre flight path of MH 370 could be explained by a pilot experiencing the symptoms of hypoxia while utilizing the heading select knob of the autopilot mode control panel, or entering random waypoints in the flight management computer, the strange course changes could also have occurred as result of an electronic fly-by-wire airplane operating in an inconsistent manner because of fire or intense heat affecting flight control systems. But where could the fire or heat have originated? The cargo manifest listed almost 500lbs of lithium-ion batteries loaded onto MH 370, a portion of that loaded in the forward compartment. The forward compartment is only separated from the electronics bay by a fire retardant liner and a bulkhead. As a matter of fact, entry to the cargo compartment from the electronics bay can be gained through an access door. Recent studies of lithium-ion batteries have been high on the list of the FAA’s safety topics. These batteries have a very dangerous and dramatic characteristic called “thermal runaway.” If even one cell becomes overheated, it can affect other cells in a chain reaction such that an explosive and spectacular fire results. Additionally, if a Halon or water fire extinguisher typically found on most airliners is utilized, the batteries have a tendency to re-ignite if not properly contained and/or cooled. Although the infamous Samsung Galaxy Note 7 phone had a design flaw created by the battery manufacturer, the danger of fire was the same concept. The fire suppression in the 777 cargo compartments uses a sophisticated system of detection and air circulation. If smoke is detected, a warning is sent to the cockpit. Pilots initiate the suppression process by pressing the appropriate button on the overhead panel. A portion of Halon fire retardant is immediately dispersed. The remaining portion of the Halon is then automatically regulated over a 180-minute time period. Unfortunately, it has been determined that the fire suppression system may not be sufficient to handle a lithium-ion battery fire. In addition to the potential inadequacy of the extinguishing agent itself, the delayed metering of the automatic extinguishing system could be problematic. If the fire re-ignites, the timing might be such that Halon is not being dispersed at the critical moment. The fume environment created by even a smoldering lithium-ion battery thermal runaway has dire consequences, causing incapacitation or death. This would be another form of hypoxia. Many airlines have drastically revised their policies on carrying these batteries. Although MH 370 wasn’t the direct cause of the policy change it was certainly the catalyst. With whatever scenario is considered, the information disseminated thus far indicates to me that MH 370 had an operable autopilot right up until the point that the engines, one by one, ceased to operate because of fuel exhaustion. I find it doubtful that anyone, including the pilots, was conscious for the final moments. At this point, we can only make an educated guess about the fate of Malaysia Flight 370. It is my wish, along with the families of 239 victims, the search resumes. 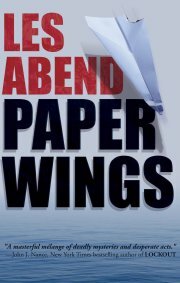 The world still wants answers to the greatest aviation mystery of the 21st century. Simply stated, the primary goal of any accident investigation is to prevent the same circumstances from ever occurring again. An excellent article – thank you! I have been slightly obsessed ever since the disappearance of MH 370, and I haven’t found another article that explains possible scenarios like yours has. I hope they will continue the search, especially now that they have a different potential crash area.Thanks again! Great article Les. Makes the most sense from all I have heard. Sounds similar to the Payne Stewart crash. Thanks for your insights Les. A good read. Great article Les. Thanks for taking the time to think it through and share it. You’re right, it sounds more mechanical in nature than nefarious and certainly aligns with all other hypoxia/fuel exhaustion crash scenarios. Lets hope they do find the root cause so it doesnt happen again.